Michael came to see me with a very familiar request from my male patients. 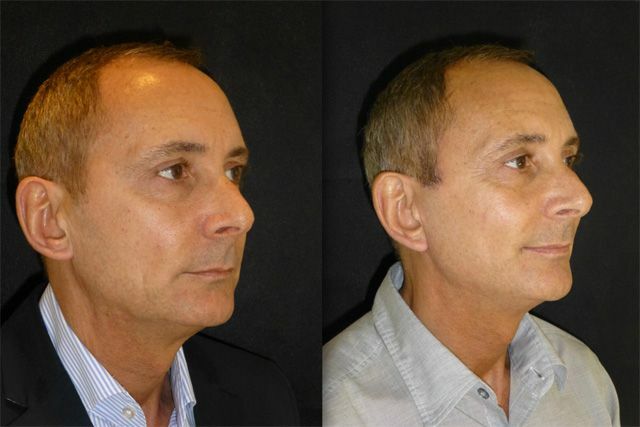 He is a dynamic executive of a plc in a high powered role and was looking to freshen his look. 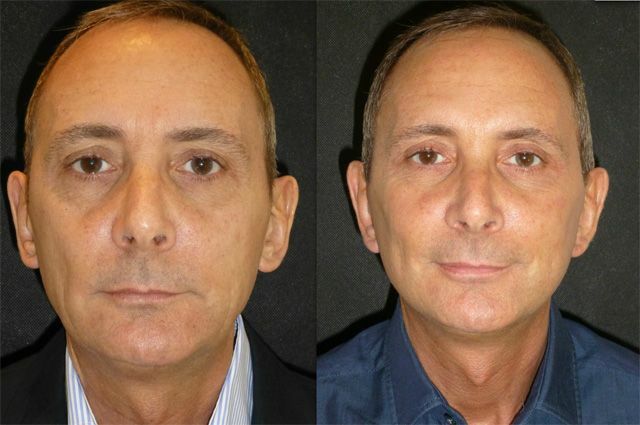 He didn’t want a radical change, just greater jawline and neck definition, reduced jowling and improvement in the tired under-eye circles. 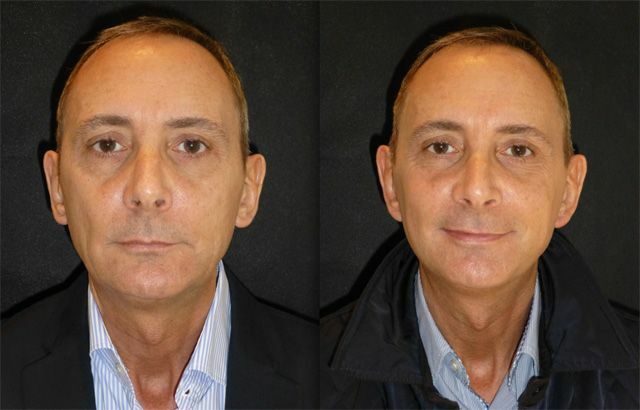 I explained that with the 70° vector my facelifts achieve he wouldn’t need lower eyelid surgery as this would be addressed by revolumising his mid face with surgery. 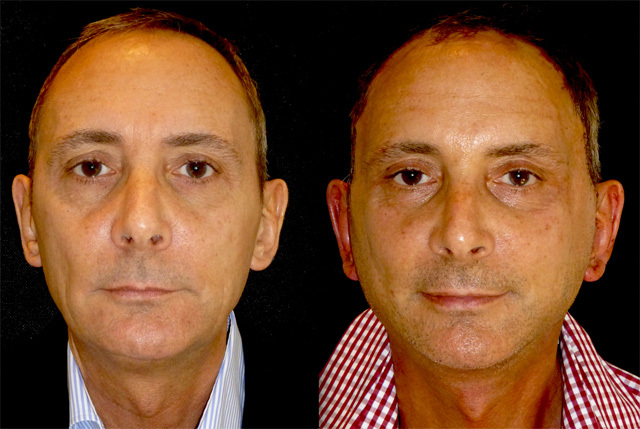 We decided to undertake face and neck lifting under local anaesthetic. Here is his journey. 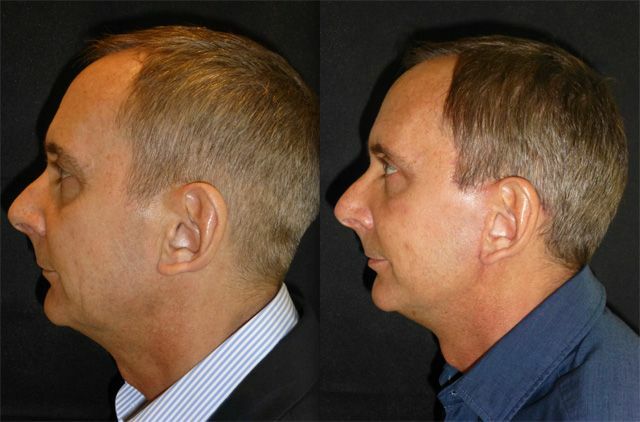 These photos are taken the morning after Facelift and Neck lift under local anaesthetic alone. 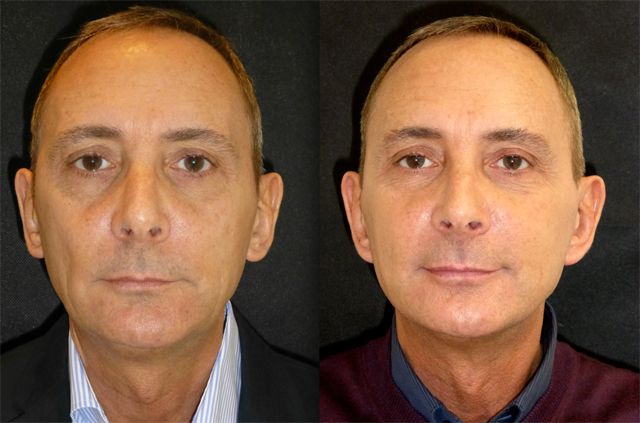 Michael arrived at clinic at 8am and was back at the Spa Hotel by 2pm. 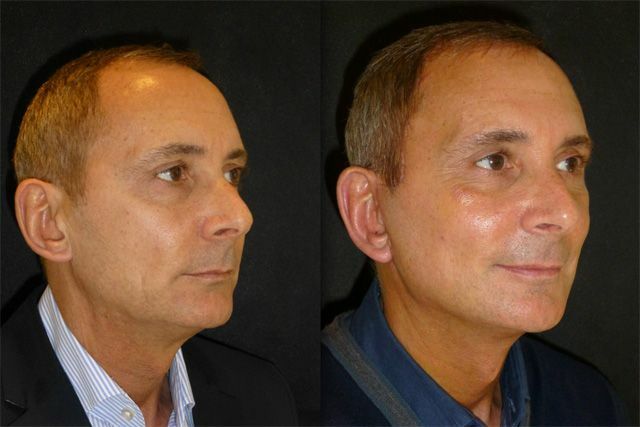 The head bandage has just been removed to reveal an improved jawline and neck contour. A session of Manual Lymphatic drainage followed by dermalux near infrared light therapy at the clinic will speed up the healing process. 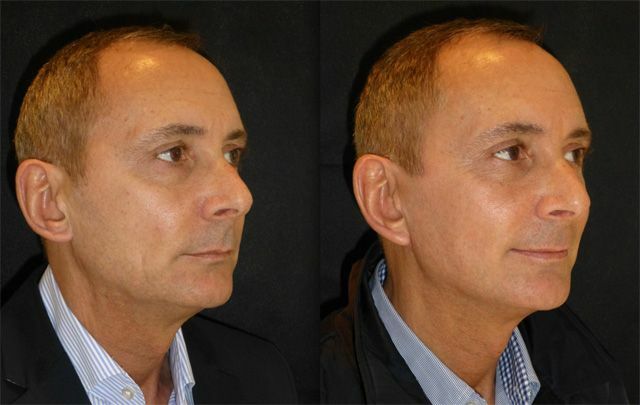 2 days later (day 3 after full facelift and neck lift) Michael is looking great. 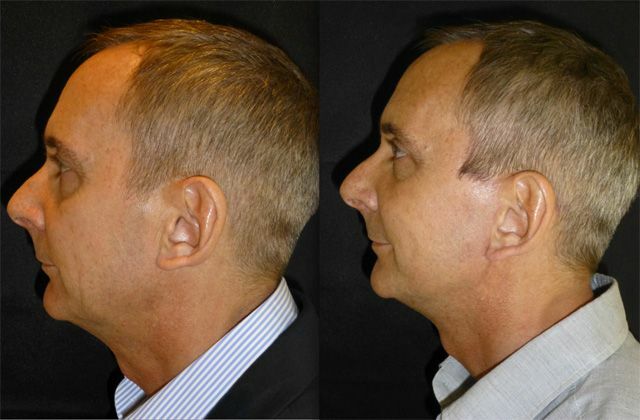 The mid facial hollowing and jowls are improved. His jawline has returned and his neck is defined. He is no longer taking any medication and feels great. His sutures will be removed in another 4 days. 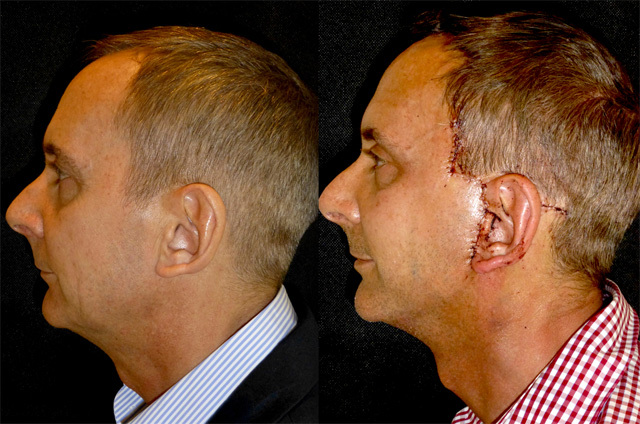 Sutures are removed from infront and behind the ear. Bruising and swelling has almost entirely gone, and Michael is ready to go back to work. 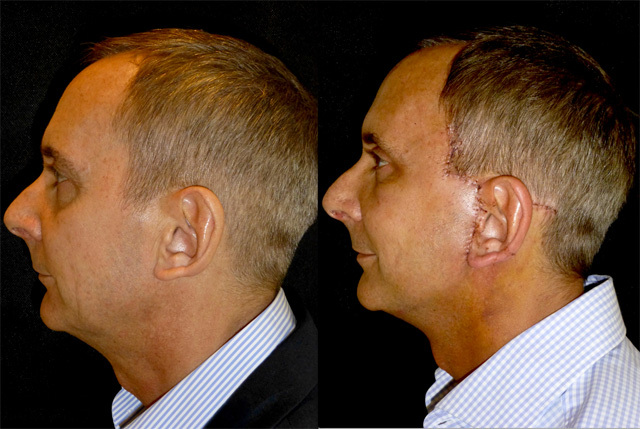 The scars are healing well and will now start to contract and lighten such that by 4-6 weeks they will be imperceptible and due to the special tricophytic incision made, hair will start to regrow through the scar. 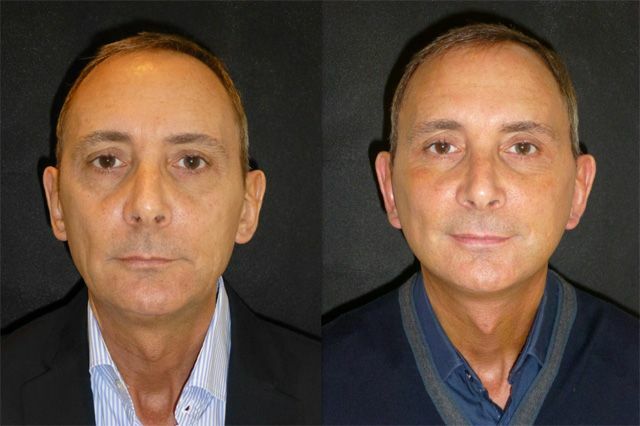 Only 28 days after a facelift and it is almost impossible to see that Michael has had surgery. Scars are only visible on really close up inspection and new hair is already growing through the incision line. 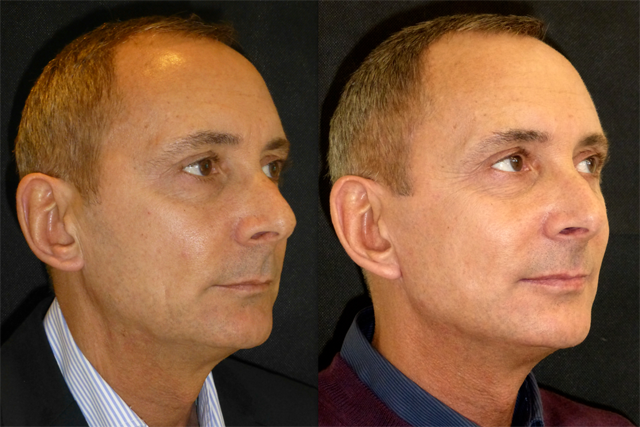 Michael is now nearly 3 months following his facelift and looks fantastic, a defined jawline and sharp profile compliments his natural persona which is friendly, cool and engaging. 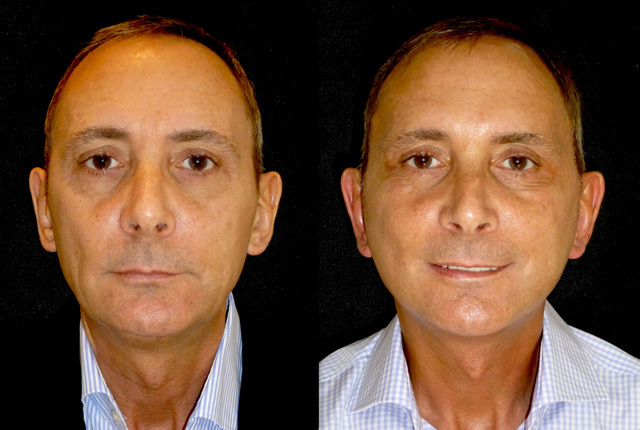 His facial proportions and upwards volume shift has resulted in a fresher, more balanced and softer face. 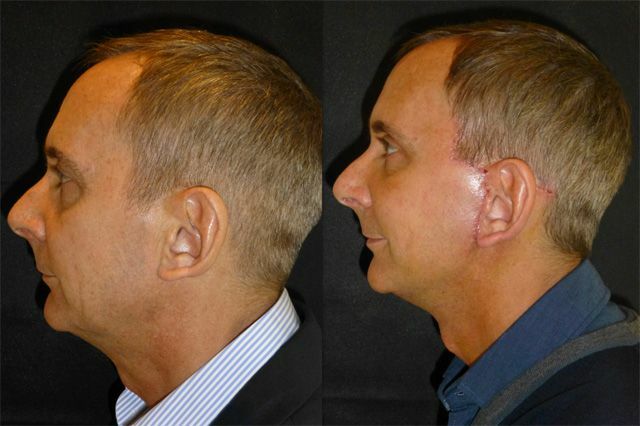 Here we can see how the scar heals. 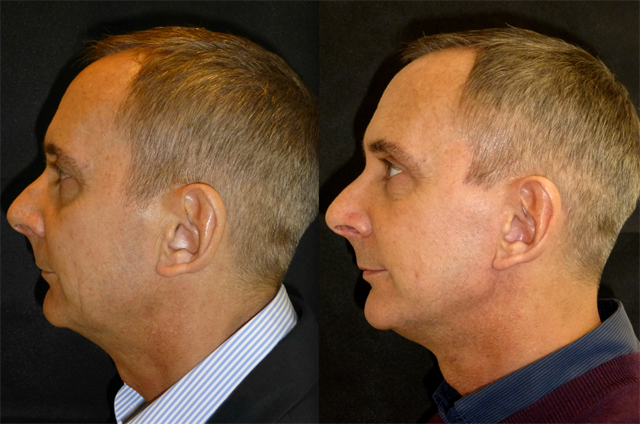 The tricophytic incision in the temple hairline is now completely covered by new hair and invisible. The little scar behind the ear hairline is always the slowest to heal (due to the lack of soft tissue support in that area) but is now flat and soft. It will contract and narrow over the coming weeks. 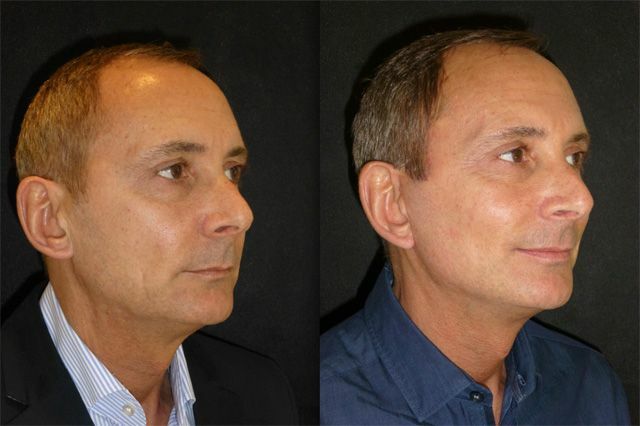 Here is Michael 6 months after Facelift and Neck lift. 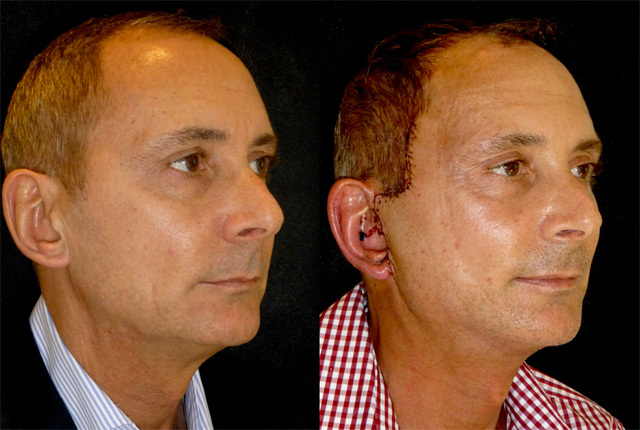 Not only are his scars now completely invisible even on close inspection, his facial tissues have settled leaving him with a freshened complexion. 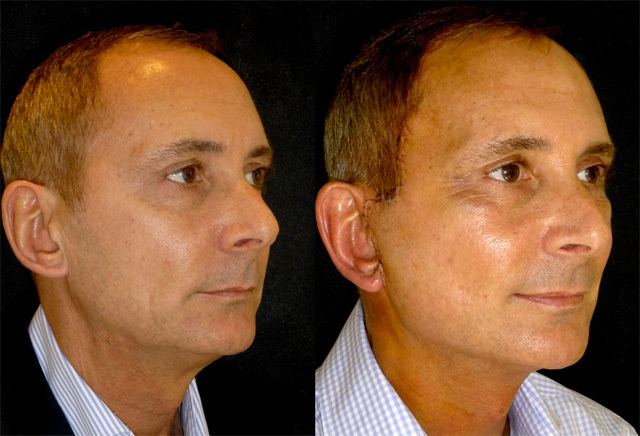 His jawline and neck are redefined, his mid face is fuller and those under eye dark circles have improved. 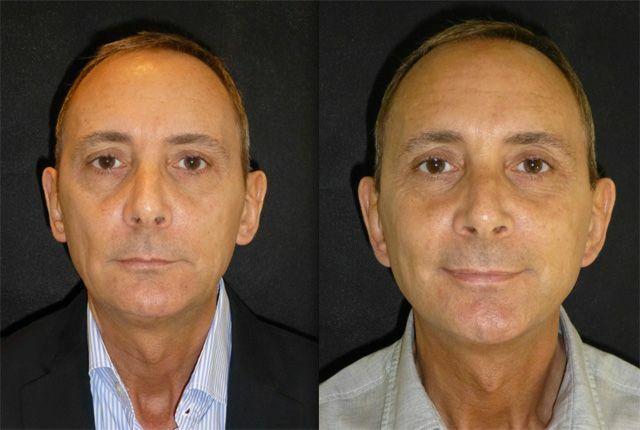 Michael is a great example of how facelifting in men can improve ones appearance without the prolonged downtime or pulled appearance associated with traditional surgery.